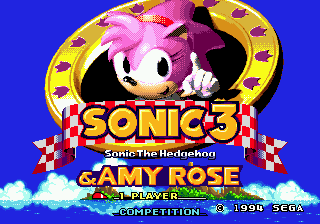 This is a hack which replaces Sonic the Hedgehog with Amy in Sonic the Hedgehog 3 & Knuckles for Genesis. This is Sonic 3 & Sonic & Knuckles locked onto each other. Amy in the hack is classic Amy designed after her Sonic CD appearance. Amy’s moves are inspired by those used in her Sonic Advance appearance. She is slower than Sonic, can’t use spin attack but has other moves. An attack button has been added and other moves can also be performed by using combinations of buttons and directional pad presses. A complete move list is found in the readme. The ROM should be in BIN format. It has not been tested for compatibility on other formats. The patch is in xdelta format due to shifted data resulting in IPS patches containing original code. Added remaining few missing sprites, plus a Bonus Stage slot picture and title screen animation. Fixed clunky break mechanism for Ice Cap walls. Tails now appears when entering Ice Cap via normal route (he’s still absent via Knuckles’ entrance however). 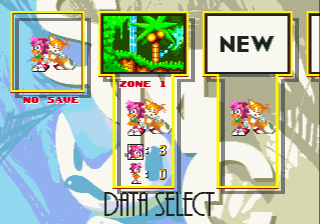 Tails now runs at the same pace as Amy, meaning no annoying skidding every time the COM overtakes her. 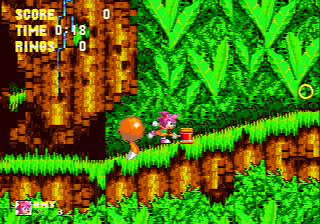 Third in the line of “Amy Rose in classic Sonic game” hacks. Amy plays just as she does in the other similar hacks starring Classic Amy. The new moves will give you a new way to take on old levels. I recommend trying out this hack. Be warned it’s not compatible with all emulators. You may have to experiment to find a compatible emulator.